While many in the media will generously report about 'an agreement to keep trying to agree,' -- let's face it: this is where the West and Iran were a year ago. Iran Won't Allow Verification Of Its Nuclear Sites -- Will Obama Backtrack on Yet Another Condition For A Nuclear Deal? Talks over Iran’s nuclear program have hit a stumbling block a week before a key deadline because Tehran has failed to cooperate with a United Nations probe into whether it tried to build atomic weapons in the past, say people close to the negotiations. 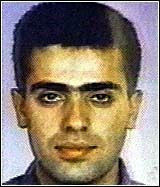 The Israel Project has been following this and other developments very closely. In a series of emails it sent out, TIP explained the huge significance of Iran's refusal. Top Violator Of Women's Rights Around The World? This article by Anne Bayefsky originally appeared on FoxNews. Guess who is the number one violator of women's rights in the world today? Israel. Violating the rights of Palestinian women. At least that is the view of the UN's top women's rights body, the Commission on the Status of Women (CSW). CSW ends its annual meeting on Friday, March 20 by condemning only one of the 193 UN member states for violating women's rights – Israel. 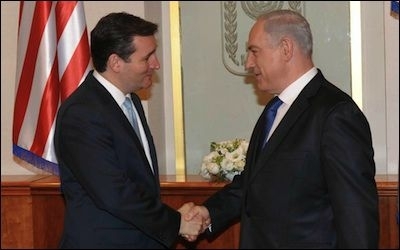 Texas senator Ted Cruz meets with Israeli prime minister Binyamin Netanyahu in Israel, January 11, 2013. A week after taking office, Cruz traveled to Israel on a congressional delegation trip, led by Senate minority leader Mitch McConnell. When, in the midst of the 2014 Hamas-Israel war, the U.S. Federal Aviation Administration briefly banned American carriers from flying to Israel, Sen. Ted Cruz (Republican of Texas) accused Barack Obama of using a federal regulatory agency "to launch an economic boycott on Israel, in order to try to force our ally to comply with his foreign policy demands." In so doing, Cruz made an accusation no Israeli leader would dare express. This is hardly unique: Over the years, other American political figures, both Republican (Dan Burton, Jesse Helms, Condoleezza Rice, Arlen Specter) and Democrat (Charles Schumer), have adopted tougher, and sometimes more Zionist, stances than the Israeli government. This pattern in turn points to a larger phenomenon: The Arab-Israeli conflict tends to generate more intense partisanship among Americans than among Middle Easterners. The latter may die from the conflict but the former experience it with greater passion. Two major concessions have gutted the Iran deal, making it into bad deal: a concession allowing Iran sufficient infrastructure during the deal to permit a breakout (i.e. none or limited dismantlement) and a concession allowing Iran to become a legitimate nuclear power on the brink of breakout after the deal (the sunset clause). Iran should have to meet three conditions, in addition to Iran giving up its nuclear infrastructure, before sanctions are lifted. Iran should be forced to end: aggression against its Arab neighbors, its export of terrorism, its pledge to annihilate Israel. Crucial line: "if Iran wants to be treated like a normal country, let it act like a normal country." Key line overall: "If the deal now being negotiated is accepted by Iran. That deal will not prevent Iran from developing nuclear weapons. It would all but guarantee that Iran gets those weapons, lots of them."